Creative types getting into the home staging industry often get sucked into wasting hundreds if not thousands of dollars on training by making these 5 common mistakes. 1. Taking home staging courses from someone who has never been a successful home stager. 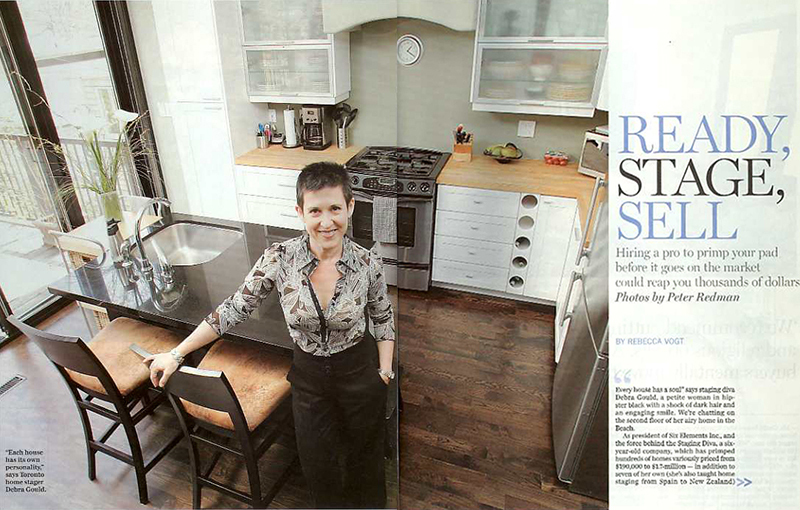 Staging Diva Debra Gould featured in 8 page spread in National Post Homes. This is especially common because many companies claiming to offer you home staging credentials are lead by people who have never earned a living as home stagers. If you don’t think that matters, consider how likely they are to teach you things that work in the real world. It’s easy to avoid this mistake, all you have to do is Google the trainer’s names—and company/brand names— you’re considering. You can also check them out on LinkedIn to see their employment history and education. Pay special attention to the dates. 2. Chasing after home staging credentials because you think these will give you credibility. This is a common mistake when you’re entering a new field and worried that potential clients won’t take you seriously. The first thing you need to recognize is that contrary to misleading claims being made in this industry, there is no such thing as an official home staging credential. If you are “certified” or “accredited”, it just means you took a particular course. This is a completely unregulated industry and anyone can offer “certified courses” because there is no law or regulation to stop them. When I started teaching home staging courses in 2005, I deliberately chose to avoid calling Staging Diva Graduates “Certified,” because I find this misleading to potential students as well as the general public. Remember this was my choice! It’s doesn’t mean you’re any less “Accredited” as a Staging Diva Graduate than anyone else from another program. I just don’t play this marketing game for the reasons mentioned. You can choose to call yourself “certified” no matter what program you take, since there’s not really any such thing. Seriously, even in legitimately regulated fields (medicine, accounting, law), I’m sure you’ve seen plenty of people you wouldn’t trust no matter how many certificates or degrees they have on their wall. And, did you know that in many cities home inspectors aren’t even regulated? If you don’t need a special credential to call yourself a home inspector (where a mistake could lead to someone buying a property with hundreds of thousands of dollars of hidden defects), it’s unlikely there will be any great rush on the part of governments to regulate home staging. You get credibility from the quality of your work, the way you treat your customers, your knowledge and contributions to your industry, your marketing efforts and any media attention you receive. The right home staging course will address all of these factors and teach you what you need to know to present yourself in a professional way. So make sure you find out exactly what you’ll be learning rather than just letting “certification” be your guide. Take a proper look at the description of each course, get a free sample, talk to your trainer. 3. Assuming that because a home staging course is endorsed by an association that it’s more official. House and Home Magazine recommends contacting Staging Diva to find the right stager. There are many associations claiming to be the voice of the home staging industry. Some provide useful information to their members. If you’re assuming home staging associations are completely independent and objective, dig a little to find out if that’s true. Most are owned by people who also own home staging schools or offer training themselves, or their boards of directors are made up of trainers. So, naturally they’ll endorse their own programs. Others charge a fee to home staging training companies to be endorsed by them. So if they don’t endorse a particular program it may only mean that the training company didn’t choose to “apply” to be recognized by them. If an association is not completely independent, you cannot assume because a home staging course is recognized by them that it automatically means it’s good training. If might very well be a great program, but you should look closer to make sure it meets your needs. 4. Assuming that all testimonials you read are legitimate. You’ll never know with 100% certainty unless you contact the person giving the rave review personally. If the website running the testimonial uses incomplete names or doesn’t provide a photo and location, consider this a red flag. There should be enough information provided to show that there’s a real person behind the words, and to make it possible for you to Google them if you want to. Really read through these testimonials to see what kind of things they talk about. You’ll gain some insight into the types of people that take various programs and what they were looking for and why. If all it says is “great program” that might mean it was great for them, but it doesn’t mean it’s great for you. Different students have different needs. Consider your own needs (rather than hype) when you’re evaluating any home staging course. 5. Believing that the presence of media logos on someone’s website means the person is a recognized expert in the home staging field. Sadly, anyone can put logos on their website, whether or not they’ve actually appeared in that magazine, newspaper or on a particular TV show. So don’t take logos or claims of media attention at face value. Look for actual TV clips, visuals of the actual pages they were on, or story excerpts that appear credible. Sometimes you’ll even find links to the story on the media company’s website. I provide these wherever possible when I mention a story or any Staging Diva media appearance. The key message here is take some time to consider what you’re being told rather than taking it all at face value. There are great home staging courses for people with different needs. When you have a better picture of what you’re looking for and why you want to take a course, then you’re in a better position to evaluate whether you’ve found the right one. Click here to read about the Staging Diva Home Staging Business Training Program and what makes it unique in the industry! You’ll also find this comprehensive home staging FAQ for aspiring home stagers helpful. Biz partner & I have staged 5 houses this year in DC and/or very close-in MD neighborhoods (ie w/in 1-2 miles of DC line) Houses were listed in $1,040,000 (smallish house with not-great curb appeal) to $1,700,000 range and all but the low-end house, owner got offer for full price or more w/in 2 wks that lead to settlement. Biz partner & I are home girls & well-connected but unsure of pricing structure, client contract terms, etc. Have already gotten calls from agents who are heavier hitters – the better family houses in our area sell for $2m – $3m. Many are historic – not enormous but lots of curb appeal/charm but lacking in closet space, bathroom space, etc. Looking for classes /advice from stager who works with similar clientele. Thx very much! I have always love decorating and because of that I considering staging I believe this is a career that I can succeed in and would like to try very much the end and out and how to proceed. Sandra, You’ve totally come to the right place to use your decorating talent to build a business. I look forward to welcoming into my inner circle where I share the complete formula for growing a profitable home staging business. I was excited to read about your accomplishments! Looking forward to more information about becoming a stager. I have a great interest in pursuing this field. Need some guidance! Hi Ann, thanks for commenting! You’ve totally come to the right place to learn how to make money from your creative talent! I hope you’ve joined my email list (see the sign up box on the top of this page!) so that you’ll get my free monthly newsletter and advance notice of any special promotions… like the one coming out in the next day or so for the holiday weekend! Looking forward to getting more information. Staging has always been my passion. Angelia, I hope you’ll join me for a Mini-Course I’m teaching by telephone conference call. You can grab a FREE pass to this event, called 5 Simple Secrets to Making More Money in Home Staging at this link. You’ll find all the details on that page. And note, that even if you can’t attend live, as long as you’re pre-registered, you’ll get a free recording of it afterwards. I just subscribed you but you’ll need to look in your email for the confirmation email from me and go ahead and confirm your subscription. For anyone else reading this, you can subscribe to Home Staging Business Report just by entering your name and email in the green box on this page. Great information for my situation. Thanks for commenting! You’ll also be getting a free subscription to my monthly newsletter Staging Diva Dispatch. With both of these you’ll get a first hand look at what learning with me is like. Your article helped me out a lot. I’m looking forward to starting a new career in staging. And wanted to know the best way to go about it . Thanks this was very helpfull. I truly have a passion for interior decorating and would love being able to be a home stager. So this has inspired me even further!!! I’m so happy to hear that Cary, thanks for commenting! I would like to receive Home Staging business Reports. So glad you’re interested Sonia. As a starting point, why not sign up for this Free Jumpstart Course? Please send me the home staging business report-thanks! Annie, I just subscribed you to Home Staging Business Report as you requested, please check your email so that you can confirm your subscription. That’s great Dekasa! As a next step, perhaps you’d like to try my free quiz to see if you have the eye of a home stager. I look forward to teaching you what you need to know to start and grow a profitable home staging business. I would like more information on your staging courses. Hey Kimberly, Thanks for your interest. I just signed you up for the FREE Staging Diva Home Staging Quiz. Watch your email for it. Inside the quiz (which I think you’ll find fun and informative), you’ll also find a full description of the Staging Diva Home Staging Business Training Program. You can also learn more about it here. Tiffany, Thanks for your interest. I just signed you up for the FREE Staging Diva Home Staging Quiz. Watch your email for it. Inside the quiz (which I think you’ll find fun and informative), you’ll also find a full description of the Staging Diva Home Staging Business Training Program. You can also learn more about it here. Thanks for commenting, looking forward to showing you how to turn your talent into a successful home staging business. Sandra, Thanks for your interest. I just signed you up for the FREE Staging Diva Home Staging Quiz. Watch your email for it. Inside the quiz (which I think you’ll find fun and informative), you’ll also find a full description of the Staging Diva Home Staging Business Training Program. You can also learn more about it here. I am very interested in more information about Home Staging. Hi Carmen, I noticed you’re already on my email list because you ordered the free home staging quiz. If you have some specific questions you’d like answered, please don’t hesitate to reach out to me by email. Simply hit the “reply” button on my last email. Glad to have you in the community and I look forward to helping you grow a successful home staging business! I also offer various free reports to get you started. You’ll see them offered on this site. When you’re ready to take your learning further and get the full blueprint for having a successful home staging business, I hope you’ll explore the Staging Diva Home Staging Business Training Program. Great article! Sign me up for the subscription please! I am very interested in Home staging. I have been for many years I just never had the chance to get started. I would love the subscription as well as getting more information. Fantastic Bridgette, please use the sign up box to receive your subscription. And what is the fee? And if you check soon, you’ll be able to take advantage of the huge sale I’m running right now! i have been given a opportunity to start staging homes with two brokers here in Hawaii. I want to be successful for myself and for them because they are giving me such a great opportunity. That’s fantastic Marsha! I can teach you how to make a great living from those first projects. I hope you will check out the Staging Diva Home Staging Business Training Program. You’re most welcome, happy you’ve found our community of home stagers! Thanks–I am trying to figure out which class would be best for me and would love any information that will help me find the right one. Hi Susan, Thanks for commenting and I’m glad you found me. I’ve just signed you up for my Free Jumpstart Course so you can get a better sense of what learning with me is like. You will find lots of helpful tips in there that will help you narrow down what program is right for you. I also encourage you to read about the Staging Diva Home Staging Business Training Program in more detail. I am interested and would love some home staging materials. Hi Traci, Thanks for your interest! You can learn about the Staging Diva Home Staging Business Training Program in detail here. Please note it’s on sale this week! Fantastic Mary, I look forward to helping you on your journey to a successful career in home staging. Click here to read about the Staging Diva Home Staging Business Training Program in detail. I am excited to receive more information! I’m looking forward to helping you on your journey to become a successful home stager. You can read about the complete Staging Diva Home Staging Business Training Program here. I would love more information on your training and how to get in to this business please. Hi Roxanne, I have emailed you the information you requested on how to get started in a home staging business. You can also read about the complete Staging Diva Home Staging Business Training Program here. Love to have more info on how to get in to this business . is it different from country to another ? Kenza, I have a proven home staging business model that is working for my Staging Diva Grads in 23 countries so far. Some are in smaller towns, others in large mega cities in locations as diverse as Anchorage, Alaska, New York City and Tasmania! I hope you’ll check out my full training program here. I, too, would love more information! Hi Marcia, Thanks for commenting! You can read all about the Staging Diva Home Staging Business Training Program here. Tori, My courses aren’t “online” in the sense that you don’t have to be on the Internet to take them. You DO order online and then you can download them onto your own computer or have them sent to you in the mail. Either way, you are learning from home at your own convenience and since you actually take possession of the full program (rather than doing it “online”), you never lose access and you can re-listen, pause, etc as often as you like. In other words, you’ve come to the right place and I can teach you everything you need to know to make a living from your own home staging business. Please read about the full Staging Diva Home Staging Training Program here. I Debra! It’s been very enlightening reading up on your website. I was actually researching programs to enroll in to become an accredited home stager. But from reading your info., it’s not necessarily required. Is that right? I certainly would not want to waist hundreds or thousands of dollars trying to become certified if it’s not necessary. I am looking to get started with training as soon as possible and would like to get signed up for your Staging Diva Training program to become a Staging Diva Home Staging graduate. I am taking your Staging Savvy Quiz and is actually doing very well so far. I am just about to start on Room #5. What is the cost of your training program? And again, I don’t need to be accredited? That is correct, there is absolutely no requirement to be “certified” or “accredited” to be a professional home stager because none of these are official. This is marketing gimmick used by many companies in this completely unregulated industry. Anyone can create their own training program and tell people they will be certified if they take it. I encourage you to read (and listen to free samples) of the Staging Diva Home Staging Business Training Program here. You will probably find this testimonial informative as well! This Staging Diva Grad took the other “certified” and “accredited” courses first (and couldn’t make a living), she even taught one of them!! Then she took the Staging Diva Program and it completely turned things around for her. Read what Jill Gargus says here. Hi Sandi, Thanks for commenting. I’ve just added your email address to my list so you’ll get my newsletter and any special offers. In the meantime, you can read all about my Staging Diva Home Staging Business Training Program here. Very interesting article! I would like to read more. Glad to help Dana! If you’d like to read about the Staging Diva Home Staging Business Training Program, and what makes it different, please click here. Interested in more information please, consider myself a creative soul with a strong interest in home furnishings & staging. Thanks for commenting Mary! You’re the perfect type of person for the Staging Diva Home Staging Business Training Program, because I show you how to take that talent and passion that you already have and turn it into a money making business. I hope you’ll read about my home staging courses in more detail here. I’m a single mom and musician (singer/songwriter & flutist). I’ve always been passionate about design and home furnishing. I was in a car accident 2 years ago and the injuries to my spine made being a working/gigging musician difficult for the time being. I’m really interested in getting into home staging as not only a need for financial stability but also another way to create. I am very interested in more information about your training courses. This career will definitely let you use your talents and passion for design and decor and can be quite lucrative when you follow the approach I lay out in the Staging Diva Home Staging Business Training Program. You can read about it in detail here. Thank you so much for getting back to me! That’s super encouraging to hear. Of course I’m hoping to be able to do more and more physical activity as I go along so I can try to regain what I’ve lost since the accident. I’m going to take the plunge and sign up for the training. Kathryn, I’m so glad you’re focused on the future and making your dream come true despite previous setbacks. Good for you!!! Was also really happy to see that you’ve joined my inner circle of Staging Diva Students! I’m looking forward to getting to know you inside our private Staging Diva Network Online Discussion Group.